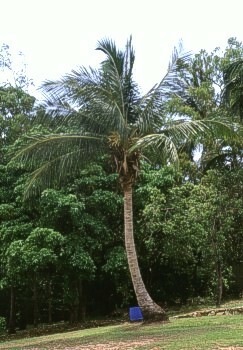 Maybe the best and most used tree on this planet: the Coconut Tree, Cocos nucifera. The idea of a coconut travelling the seas is quite common, but not really true. The fruit indeed keeps drifting for a long time until it gets washed ashore somewhere. But the germ quickly dies in the salty water. So their circumtropic distribution means, people took them in their luggage where ever they went. I remember islanders telling me, there was no part, not even the root, they would not use. The common believ is, the palm originates from Melanesia, but nobody really knows. Apart from that, the romantic idea of a small sandy island with a Cocos Palm on it is nice, but not real, either. I've seen a couple of not or not very cultivated islands, and bad maintained plantations, too. The tree seems to need human attention to grow literally everywhere in the tropics. On little, storm-exposed islands I never have seen a single coconut palm. Once they are there, they are planted for harvesting. Mountainous islands with moist soils seem to suit much better. This picture was taken in Darwin, Botanical Gardens. See rather romantic ones from Tobago here.